The case of a Colorado teenager who died this month of a rare case of plague has revived concerns about a disease many people wrongly assume died out in the Middle Ages. Taylor Gaes died June 8 -- the day after his 16th birthday -- of what was later confirmed to be plague. Officials say this is the first case of the disease since 1999 in Larimer County, about 2 hours north of Denver. Gaes, a top high school athlete who was both football quarterback and starting pitcher on his baseball team, started feeling sick with flu-like symptoms earlier this month, CBS Denver reports. A few days later, when he began coughing up blood, his parents rushed him to a hospital in Fort Collins. They were just 5 miles away when Gaes stopped breathing and died. Plague can be treated with antibiotics if it's caught early, but that doesn't always happen because the illness is so rare and initial symptoms like fever and body aches mimic those of the flu. "The quick onset like he had, often accompanied by some aches and pains, those are really the only symptoms that Taylor complained of, so it's a very general, hard to diagnose type of illness," Katie O'Donnell, a spokesperson for Larimer County Public Health and Environment, told CBS Denver. The most common form of the disease, bubonic plague, accounts for about 80 percent of cases in humans, according to the Centers for Disease Control and Prevention. Its hallmark is painfully swollen lymph nodes, known as buboes, along with fever and chills, a severe headache, body aches, and exhaustion. Another form of the illness, pneumonic plague, occurs when the bacteria infects the lungs. In very rare cases, pneumonic plague can spread from person to person through droplets in a cough. In Gaes' case, health officials believe he developed septicemic plague, meaning the infection got into to his bloodstream, a condition with a high fatality rate. Plague is caused by the Yersinia pestis bacteria, which is spread through the bite of fleas carried by infected rodents. Health officials believe Gaes may have contracted it from a dead rodent or other animal on his family's ranch. "Rodents, animals in the rodent family, are the reservoir and fleas that bite them can become infected and bite humans," Dr. Michelle Barron, an infectious disease expert at the University of Colorado Hospital in Denver, told CBS News. "It's frequently seen in prairie dog colonies." Cases of plague, when they occur, tend to be clustered in rural areas in western or southwestern states where fleas live on the wild rodent population. "Not all fleas have this," Barron said. "There are different flea populations more likely to become infected." She said most dog and cat owners have little reason to worry, but in rural areas, pets that encounter wild animals could bring the fleas home. "Normal household pets do not carry the fleas that contain the plague at all," medical contributor Dr. Holly Phillips told "CBS This Morning." "But people who hunt or hike, spend time in rural areas where the plague might be endemic, they should let people know" if they develop possible signs of illness. Barron agreed that awareness is key: "If you've been traveling, if you're a hunter and been outdoors... If you know you've had those kind of exposures and you have those kind of symptoms, that's something you want to be aware of and raise it to your health care provider," she said. "When you see your doctor with vague symptoms, mention if your pet isn't well or if you've been hiking or around animals that aren't well." Those clues could lead to quicker diagnosis and treatment, which increase the odds of survival. Outbreaks of plague killed millions of people in Europe in the Middle Ages, when flea and rat infestations were rampant and there was little understanding of how to prevent infectious disease. By some estimates, one third of the population died. "Now, it's very rare, especially in the U.S. There are only about 7 to 10 cases a year, but it still exists," Phillips said. Last year, a 7-year-old girl recovered from the plague after contracting it while camping in southwest Colorado. Her mother said she may have been infected when approaching a dead squirrel she wanted to bury. Avoid contact with all sick and dead rodents and rabbits. Look for the presence of blow flies or dead animal smell as evidence of animal die-offs. 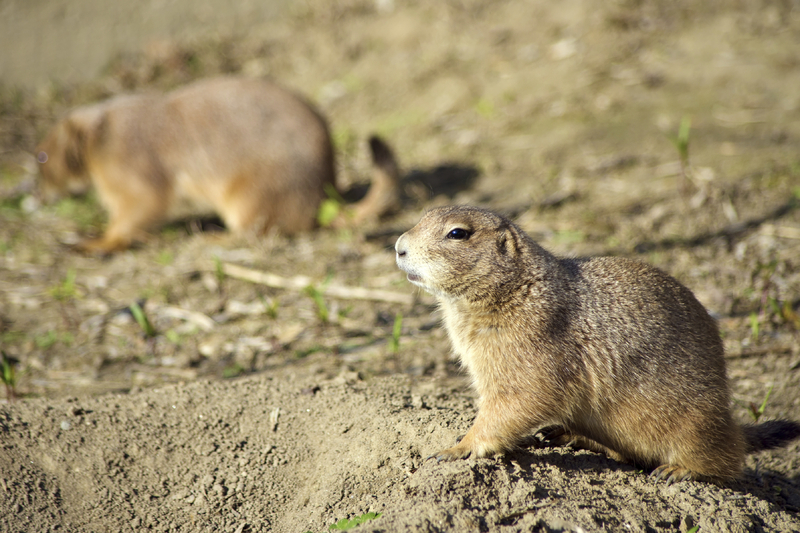 Prairie dog colonies that suddenly are not active may also be due to plague activity in the area. While hiking, treat pants, socks, shoe tops, arms and legs with insect repellents. Keep your pets from roaming and hunting and talk to your veterinarian about using an appropriate flea control product. If you hunt or trap rabbits or carnivorous wild animals, wear gloves and a respiratory mask while skinning or handling these animals. Fresh pelts may be treated with flea powder. Bites from wild carnivores and from cats and dogs have caused human plague. Such animals may be infected, carry the bacteria in their mouths or may transport infective fleas. If you are bitten, follow-up with your health care provider. DO NOT feed or entice any rodent or rabbit species into your yard, back porch, or patio. Eliminate rodent habitat, such as piles of lumber, broken cement, trash and weeds around your home, outbuildings and cabins. When outdoors, minimize exposure in rodent-infested areas. Do not catch, play with, or attempt to hand feed wild rodents.